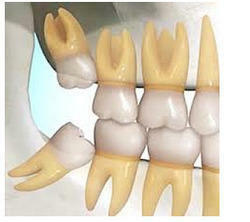 - 3 unit Bridge: that requires the reduction of adjacent teeth. - Partial denture: that need to be removed before going to sleep. Your teeth work together like a finely tuned machine, and losing even one tooth could be the start of serious problems if it isn't replaced promptly. this booklet shows you what can be done to fill in the gaps in your smile. modern dental procedures provide a host of options for replacing missing tooth-from traditional dentures to crowns & bridges (metal ceramic and metal free ceramics) to the latest dental implants. A dental implant is an artificial tooth with titanium root replacement that is placed into your jaw to hold a replacement tooth or bridge. Dental implants may be an option for people who have lost a tooth. They are made of bio compatible materials that become directly attached to your jawbone. Once anchored in place, your implants can be used to replace a missing tooth, support an entire set of teeth or retain an over denture. The result is a natural type of tooth replacement that can restore the biting and chewing ability you once enjoyed, improve your appearance and renew your self-confidence. Tooth loss is a process in which one or more teeth falls down. It is normal in children but in adult it is not a sign of good health.